Having the good fortune of being based in one of the top flying areas of Britain, we feel you will receive the highest quality of service with Air Ventures. We are open seven days a week with the weather being the only variable to hold us back. 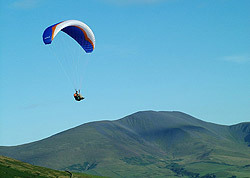 Air Ventures website provides comprehensive information on all our paragliding courses and will also carry additional news on special events, equipment promotions and specialist courses as and when applicable. We are also the only UK school to provide BHPA speedflying training and qualification.